Help to restore the ecosystems of the Calumet Region and support Tryon Farm Institute with these limited edition ecosystem seed bombs. Each variety contains species curated to grow in the various ecosystems and attract the critical critters that indicate the health of the local environment. The varieties include the Short-Grass Prairie, Wetland Rain Garden. Upcoming varieties will include the Woodland Understory and Sedge Meadow. Each pouch comes with 5 seed bombs and a log book packed with information about the various ecosystems, information on how to plant and a log book to help track the progress and benefits of the habitat restoration. 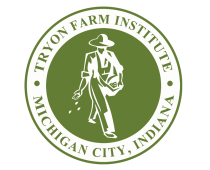 The Calumet Region seed bomb project supports land stewardship and environmental education programming at Tryon Farm Institute in Michigan City, Indiana. Please enjoy the small habitat created by these seed bombs. We like to think about how the critters making a home at Tryon Farm and throughout the Calumet Region will one day find their home in your restored habitat. We thank you for purchasing these seed bombs and participating in the #calumethabitat project. To cultivate habitat from these seed bombs simply find an area that matches the growing conditions for the specific ecosystem. Autumn is the ideal time to deploy Calumet Region seed bombs, but spring and summer are good too. Some seed species will require a winter or two before germinating. The charts following this section detail what to expect from specific species. Watch closely as your garden changes over time, attracting more diverse birds, butterflies and bees along the way.